Air Jordan Retros are expected to take center stage this year especially Air Jordan 4 and Air Jordan 10 Retros, which are scheduled for release in different variants this year. Aside from the Air Jordan 10 “Chicago” and “White Cement”, which has already created a lot of buzz, Jordan Brand will also release a Black-White-True Red colorway of the shoe dubbed as the Air Jordan 12 “Playoffs”. Originally release in 1997, the Air Jordan 12 “Playoffs” a black leather upper with white mudguard accented varsity red branding. 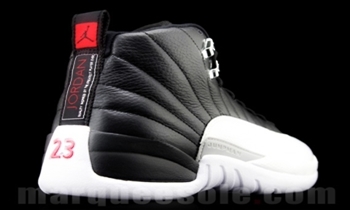 This impressive retro shoe will be released in April 2012 in time for this season’s NBA Playoffs.